Fall is the season where God’s handiwork is uniquely alive. Leaves emerge in yellow and golden hues and begin to float around your feet. Temperatures settle into lower registers, giving the wind an exciting chill to carry and reminding you to unpack your favorite sweater. 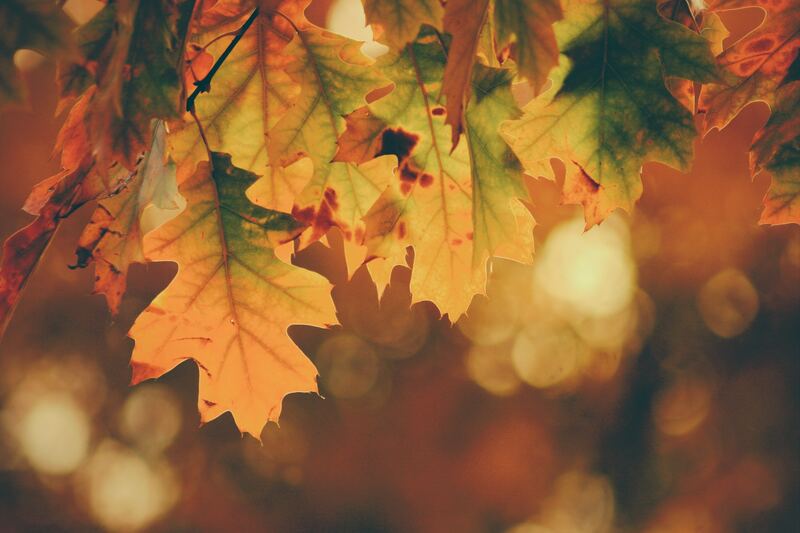 The air turns crisp and you find yourself on the porch wrapped in a quilt and sipping tea, hot with cinnamon. Foliage can vary from tree to tree, luscious reds from Black Gums, Sassafras adopts oranges and yellows, and Sweetgum can offer a brilliant purple. You are unwittingly lulled into a gratitude and kinship with nature’s bounty. My grandparents, James and Allamae Ezell, started their lives together as farmers in a yellow fieldstone farmhouse in a grove of old oak trees surrounded by rice fields in Weiner, Arkansas. Fall is my grandmother’s favorite season and although the expansive land they lived on was beautiful, it was relatively flat and did not host the autumnal splendor she adored. While the farm was always busy during autumn’s harvest season, James always made time to take Allamae on an annual tour of Arkansas’ finest foliage. They would travel into the Ozarks and stay in Eureka Springs, down into Petit Jean State Park, and through Harrison and Russellville, admiring trees from the car and on foot. When it comes to fall, Arkansas is something special. In Buffalo River country, expect nothing short of breathtaking. Hawksbill Crag, also known as Whitaker Point, is home to one of the most sought after views in Arkansas. At sunrise, you are guaranteed an awe-inspiring expanse of wilderness and watercolor skies. It’s a place for people seeking an experience off the grid requiring certain precautions and a sizable hike. The trail might be long, but there are many stopping places to rest, one featuring a waterfall. Trust me, this one is worth the effort. For those who prefer scenic drives to hiking endeavors, the stretch of US 62 from Rogers to Harrison is dense with changing trees lining the road, perfect for complete immersion. Highway 7 is another course bursting with picturesque displays of autumn, Arkansas’ first state-designated scenic route. It winds through four separate regions from El Dorado to north of Harrison. At its highest point, Mount Magazine State Park in Paris, Arkansas reaches 2,753 feet. For sweeping views of the Arkansas River Valley and Blue Mountain Lake in the crisp October air, this is the place. This park welcomes mountain bikers, rock climbers, hang gliders, horseback riders, and hikers of all skill sets. Whether you desire a grand adventure or a simple walk to ground yourself in nature, this state park will sate you. Hot Springs is a haven for all things natural, including Garvan Woodland Gardens. The botanical gardens belong to the Faye Jones School of Architecture at the University of Arkansas and boast a number of trails and attractions suitable for anyone wishing to rejoice in this season’s opulence. Accessibility is a priority making wheelchairs and strollers functional on the trails and offering golf cart tours. Their mission statement establishes their goal of “preserving and enhancing a unique part of the Ouachita Mountain environment” and “providing people with a place of learning, research, cultural enrichment, and serenity.” Their manicured gardens are in harmony with native growth, a graceful balance affirming their tranquil ambition. For our Southwestern denizens, Logoly State Park is a great retreat for relishing in this season’s offering. Six miles south of Magnolia, this park has stunning mineral springs, campgrounds, and walking trails, but Logoly doesn’t stop there. This park considers itself a resource for environmental education. At the heart of their 368 acres of coastal plain, the visitor center offers several interactive exhibits to educate visitors about conservation. The park encourages visitors to learn about the dangers of pollution and the energy crisis so that, in return, Logoly can stay the beautiful destination it is for years to come. Autumn in Arkansas is a spectacle to say the least. In every corner of the state, we are greeted with spectacular feats of nature only enhanced by fall colors. Get out there and enjoy it while the season is right. As a child, my grandmother took me on walks down Main Street in Blytheville to buy small, juicy tomatoes from an old man selling from a crate he held in his lap. She helped me pick peaches in a sprawling orchard not too far from there and I would eat them over the porch railing, honeysuckle drowning the steamy air. My first job was working at a produce stand in Jonesboro. I would buy zucchinis ladies would bring from their garden and sell them to young mothers shopping for supper. Arkansas farmers helped raise me just as carefully and tenderly as they raised their crops. As an adult, I experience a deep, nostalgic thrill visiting my local farmer’s market. The Natural State boasts an ideal environment for cultivation of all kinds. Fertile soil, dense mountain forests, rivers and lakes, all make Arkansas the beautiful, natural haven it is. At the height of the summer season, our markets and stands are thriving under this sweet heat and bustling with local charm, communal dwelling places to appreciate the bounties of our Earth. A few years ago, my grandmother moved to Texas. She insists I bring her local tomatoes when I visit. If you didn’t know already, tomatoes are an Arkansas staple. They are the state’s official fruit and vegetable, after all. In 1987, it was signed into law by former governor, Bill Clinton. Former state Rep. John Lipton who made the proposition said in his statement “the South Arkansas vine-ripe pink tomato has a taste, texture, appearance, and aroma second to none” and promised 20 lbs. of them to any of his colleagues who voted in favor of the measure. Deepwoods Farm in Warren, Arkansas is one place to find these notable tomatoes among many other varieties. Deepwoods is owned by the Donnelly family who has been perfecting tomato farming for more than 60 years. They have an onsite farmer’s market, canning workshops, and offer the opportunity to try your own hand at tomato picking. Make sure to bring one back for grandma. Saturday mornings in Fayetteville, Arkansas, are something of a great tradition. The Fayetteville Farmer’s Market is award-winning and entirely saturated in whimsy. Throw on your sunhat and get there early. Each stand in the historic downtown square bears testament to Fayetteville’s “funky” claim, offering anything from miraculously intricate hand-woven baskets to delicate, shell-pink mushrooms. Gorgeous, organic flower arrangements are abundant and there are always plenty of dogs to pet, homemade soaps to smell, and local musicians stringing along tunes for dancing children and adults alike. It’s an ideal southern atmosphere with a lot of quirks and a lot of quality. 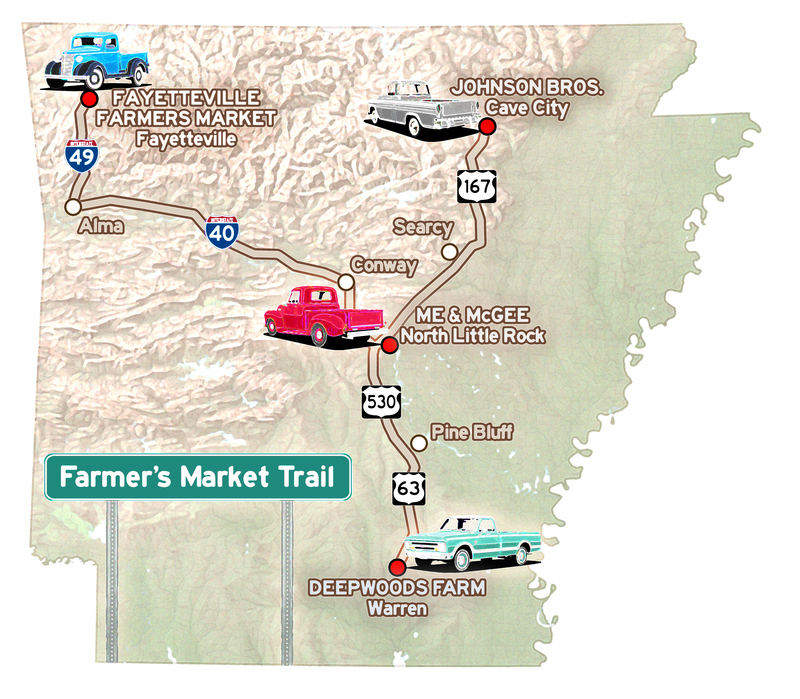 One, out of its almost 80 vendors, is Osage Creek Farms out of Green Forest, Arkansas. Their stand is run by the young, energetic couple, Kelton and Aubree Hays. Osage Creek specializes in grass-fed, grass-finished beef, free of antibiotics and hormones. Their cows are farm-born and raised, eating nothing but Arkansas grass from the pastures they are free to roam. Grass-feeding cows is a patient and more ethical process as it allows them to eat as they were biologically intended and reach a reasonable weight at a normal pace. “Grass-fed” is often a loaded term as it isn’t legally regulated. Arkansan consumers can rest easy knowing that when Osage Creek says “grass-fed,” that’s exactly what they mean. “They wouldn’t know what grain was if you hit them with it,” Kelton says. Aubree’s family has been in the business for years. Her grandfather started with only 80 acres after the Great Depression and today it has expanded to more than 1,000. Fayetteville’s unique atmosphere lends so many opportunities for locals to really show off, and show off they do. In Northeast Arkansas, the tiny town of Cave City prides itself as “Home of the World’s Sweetest Watermelons.” The Johnson Brothers are third generation farmers from just outside the town. Phillip and Gary Johnson have been growing their entire lives. When asked about his decision to carry on his family’s watermelon tradition, Gary Johnson, the younger half of the namesake, laughed and said he “doesn’t have enough sense not to.” When their father grew ill in 1976, the brothers, then 13 and 25, took it upon themselves to tend the beloved crops. Now, they sell from a single stand in Cave City and people travel far and wide to buy their fabled melons. You might wonder, what makes them so sweet? Rich and sandy regional soil take partial credit, but the real secret is vine-ripening. The Johnson family takes great care to ensure each watermelon is picked ready to eat. They are selectively harvested at the height of their sugar content and begin their deterioration the moment they are plucked. With that in mind, distributing to grocery stores and shipping long distance is nearly impossible because of their limited shelf life, making them a truly local treasure. Cave City even hosts an annual festival honoring these legendary watermelons and their various growers in the area. Take advantage of these while you can, the season is beginning and they won’t be Johnson-certified delicious for long. Me & McGee is a delightful little market in North Little Rock. Anyone who walks in the door is welcomed by their honorary greeter, Roxie, a sweet, brown dog who loves to visit. Roxie’s friendly “hello” is a total embodiment of the warmth at the heart of Me & McGee. The clever name may sound familiar. Janis Joplin’s classic, Me and Bobby McGee, sings the virtues of love, contentment and freedom. These ideas are not far off from the vision of Debbie and her very own Larry McGee. The husband and wife duo got started selling pecans from their orchard at a roadside stand in 2011. Now, they exist as a family-run marketplace and it’s, by no exaggeration, a bounding success. It’s an outlet for all kinds of goods including homemade breads, salsas, dill chips, and pickles just to name a few. Written on one of their chalkboards is the phrase, “you can’t buy happiness, but you can buy plants, and that’s pretty much the same thing.” It’s a tribute to their goal of keeping it simple and rejoicing in the small things. When you shop Arkansas local, you can always count on a lot of heart, a lot of community, and a whole lot of fresh Southern eating.